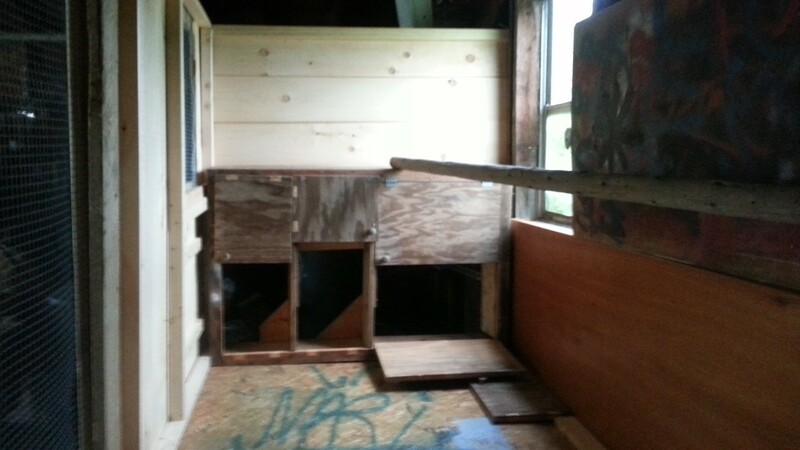 This weekend I’ve been building the new coop for my chickens. A lot of the wood was salvaged from my basement and garage, a local business that gives away pallet wood. I bought the pine boards and some of the 1x2s and 2x2s for framing. The coop is on the back wall of my garage for double security from predators and insulation against the cold. Here in Maine it can go as low as about -10 F in the winter. There are 3 nesting boxes with a big area on top for the chickens to sit in the sun. Attached to that is a perch that runs the whole length of the coop. The perch is about 6 feet long and has been in the garage since I bought the house 15 years ago – I finally found the perfect project for it! It’s the perfect width so they can sit on their feet in the winter and keep warm. (The plywood with spray paint were my son’s practice boards when he was into graffiti art – I don’t think the chickens will mind). The coop has a door on the front wall in the left bottom corner that’s about 2 feet tall so I can get in there and clean. Besides the window to outdoors that lets in some sunshine, there are 2 screened-in windows with perches in front of them so they can get some light that comes in through the garage doors, and so I can see in. They’re covered with hardware cloth to keep the chickens in and any critters out. Those windows will be covered in the winter to help the coop retain heat. 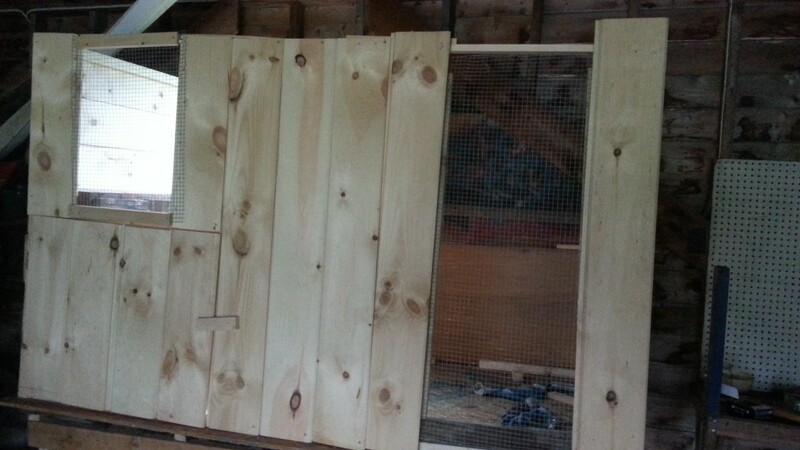 There’s going to be a door on hinges outside the nesting boxes for easy egg collection (tomorrow’s project) and a 4-foot-tall door at the other end for cleaning. There are 2 windows covered with hardware cloth (wire mesh) so they can see out. I cut about 2 feet off it and put that piece in front of the big screen window for more perching pleasure. The final project tomorrow will be putting on the roof with ventilation. Next weekend I’ll be adding a 6×6′ run area for them in the garage (for rainy, cold, and snowy days) with a little chicken-size doorway to outside and then install 100 feet of fencing outside for them to free range. It works out perfectly because that will give them a week to get used to their new home so hopefully they’ll figure out how to get back home once they’re let outside. This is my first construction project, and while it’s anything but perfect, it’s the perfect little coop for my chickens and has all the features I wanted. I love it. Opaque value pack headed to Maryland. Translucent value pack headed to Alberta, Canada. After a few requests, we now have cat eyes available in 7.5mm. The new size is available in the drop-down list for size selection. Suncatcher Craft Eyes could be included in your kits! These packs of Suncatcher Craft Eyes are on their way to one of my favorite crochet designers to include in amigurumi crochet kits. They even include a custom coupon code for a future purchase. 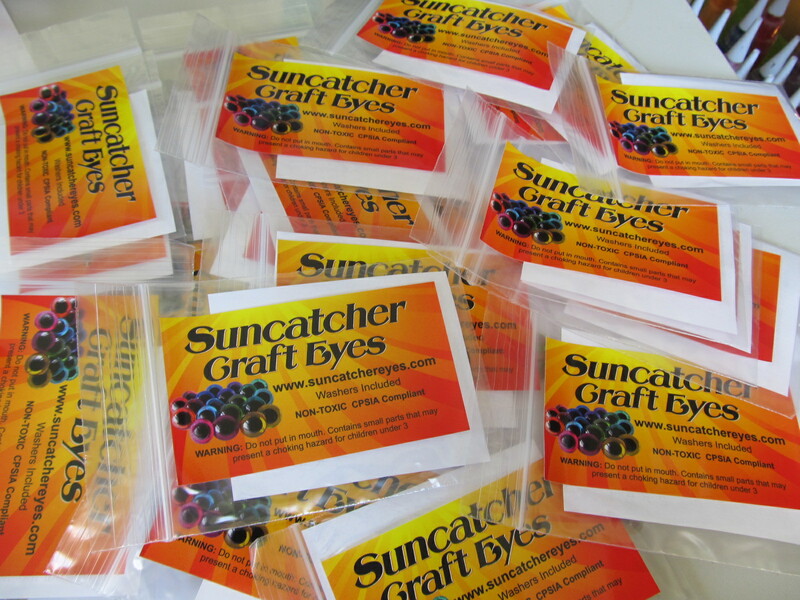 Would you like to include Suncatcher Craft Eyes in your crochet or softie kits? Contact me for more information at support@suncatchereyes.com. 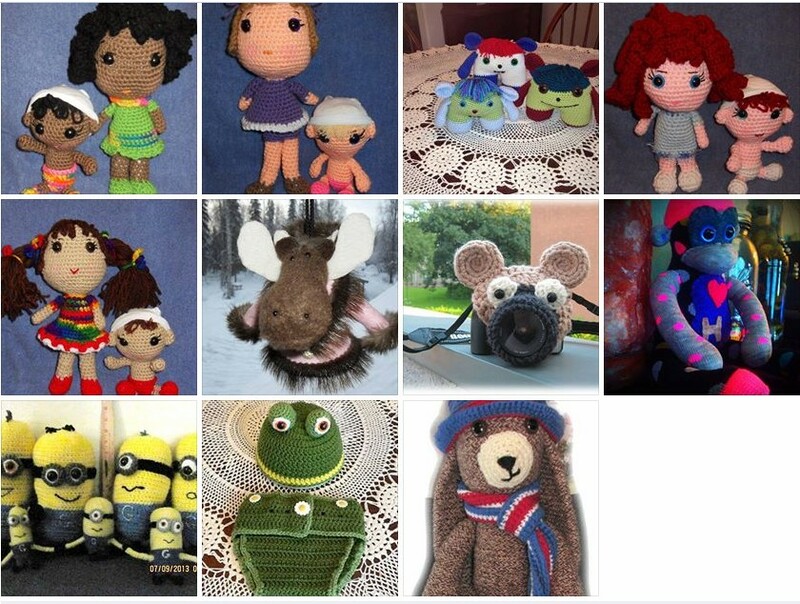 New faces in our gallery & your chance to win! Send in a photo of your project using Suncatcher Craft Eyes, and it will be added to our gallery along with your website/Etsy/Facebook link. You will also be entered in our monthly drawing to win $20 to spend at Suncatcher Craft Eyes! *One photo per project please. 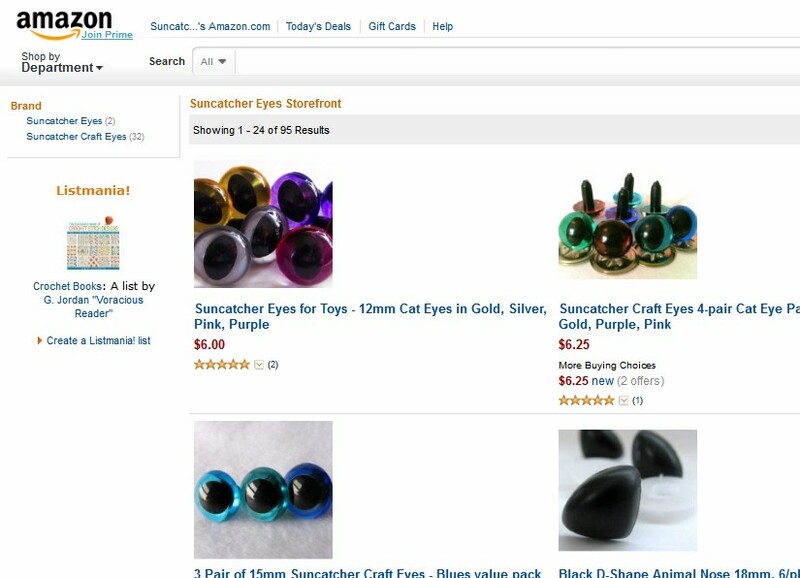 Did you know Suncatcher Craft Eyes are available on Amazon.com? The reason I created a Suncatcher Craft Eyes storefront on Amazon was to broaden our reach and get exposure to a wider audience of crafters. You will recognize some of the products I sell on Amazon, but there are some new value packs that are exclusively sold on Amazon like our cat eyes pack of green, brown, sky blue, and blue and the 5-pair pack of green, sky blue, blue, purple, and brown shown below. As always I welcome your feedback and comments. If you would like to see other products or value packs added to Amazon, just let me know. Comment below or email me at suncatchereyes@roadrunner.com.